Perfect outer shell to layer on top of your hoody. Get outside and enjoy! 100% nylon 330D with water proof coating. Six snap front closure with antique brass finish. Hood with plastic tip drawstrings. Welt pockets. Elastic cuffs. Drawstring closure with hidden snap at waist. Tear away label. *This Nylon Windbreaker Jacket is screen print friendly, and has waterproof nylon fabric. 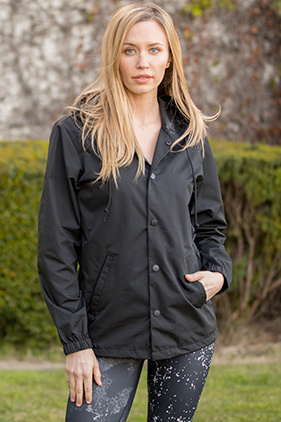 We call this jacket Water Resistant because the seams are not waterproof, and it features a snap front closure.